Scale model of the Euthanasia Coaster, showing its lift hill and seven inversions. 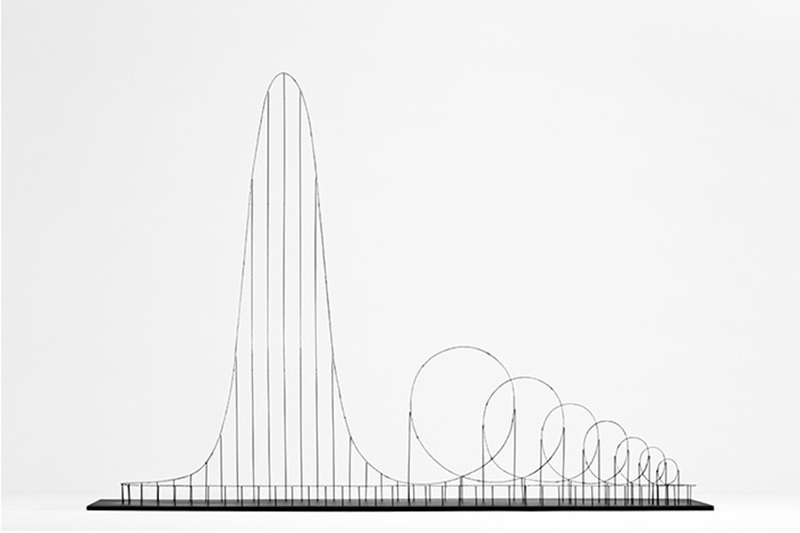 The Euthanasia Coaster was designed by Julijonas Urbonas, a Lithuanian student of the Royal College of Art PhD candidate in London. The morbid roller coaster was designed to basically kill its passengers, as humanely and elegantly as possible. Urbonas drew his inspiration from the president of the Philadelphia Toboggan Company, John Allen, who described his idea of the perfect roller coaster as being one that sends 24 people out and, at the end of the ride, they would all be dead. The design features a steep-angled lift that takes the passenger 1,670 feet (500 meters), which is followed by an enormous fall. After the descent a series seven loops are aligned, that take the car no more than a minute to pass through. In this minute, the passenger experiences a gravitational force of 10Gs, caused by spinning at a top speed of 223 miles per hour. That speed, in under a minute, is lethal. The experience for the subject is a little more cathartic. While strapped into the one-seat car, the passenger slowly starts his ride, giving him around three minutes to contemplate his decision. Once at the top of the drop-tower, and once the subject takes in the amazing view, he can then press the ‘fall’ button, surrendering to gravity, which takes him on the last thrill ride of his life. The passenger reaches terminal velocity, as the force of air drag becomes the same as the force of gravity. This cancels the acceleration, making the passenger feel as if he is supported by an invisible air pillow. Entering the hoops, the centrifugal force literally pushes the subject into the seat, immobilizing him; breathing becomes harder and harder, as the internal organs are being pulled down, emptying the lungs. The Euthanasia Coaster on display at the HUMAN+ exhibition in the Science Gallery, Dublin in April 2011. At this point of the ride, the passenger is most likely unconscious, as this immense force pushes his blood to the lower extremities, leaving his brain without oxygen. This suffocation of the brain, or cerebral hypoxia, kills the subject. If still alive, he is more resistant to the g-forces than most of the people. However, the loop is designed to maintain the force until the end. Death occurs around loop four, at most. The rest of the loop carry on with the subject’s numb body. The brain dies of complete lack of oxygen. In the extremely unlikely event that the passenger is not dead, he is sent on another ride.